June | 2012 | Beyond The Yew : Saying NO to Zionism! Given the worsening crisis in Syria, the Nezavisimaya Gazeta newspaper reported that the Russian army is apparently being prepared for a mission in Syria. Citing anonymous sources in the military leadership, the newspaper said that Russian President Vladimir Putin ordered the general staff to work out a plan for military operations outside Russia, including in Syria. Secretary of State Hillary Clinton is calling for an R2P humanitarian military intervention in Syria to curb the atrocities allegedly ordered by the government of president Bashar Al Assad. In a twisted logic, Clinton recognizes that while “opposition forces” are integrated by Al Qaeda affiliated terrorists, the government rather than the terrorists is held responsible, without a shred of evidence, for the ongoingmassacre of civilians. Amply documented, these sectarian killings and atrocities are being committed by foreign mercenaries and militia which are armed and supported by the Western military alliance. The killings are carried out quite deliberately as part of a diabolical covert operation. The enemy is then blamed for the resulting atrocities. The objective is to justify a military agenda on humanitarian grounds. “Code named Operation Northwoods, the plans reportedly included the possible assassination of Cuban émigrés, sinking boats of Cuban refugees on the high seas, hijacking planes, blowing up a U.S. ship,and even orchestrating violent terrorism in U.S. cities. In the logic of Operation Northwoods, the killings in Syria are carried out to “create a helpful wave of indignation”, to drum up public opinion in favor of an R2P US-NATO operation against Syria. “The international community cannot sit idly by, and we won’t”, said US Secretary of State Hillary Clinton. What lies behind this outburst of humanitarian concern by “the international community”. Is America coming to the rescue of the Syrian people? What is the real reason for America’s war on Syria? In an unusual twist, “the answer to the question”, namely “the real reason” is provided in the article’s subtitle: “Cutting Iran’s link to the Mediterranean Sea is a strategic prize worth the risk.”. The subtitle should dispel –in the eyes of the reader– the illusion that US foreign policy has an underlying “humanitarian mandate”. Pentagon and US State department documents as well as independent reports confirm that military action against Syria has been contemplated by Washington and Tel Aviv for more than 20 years. 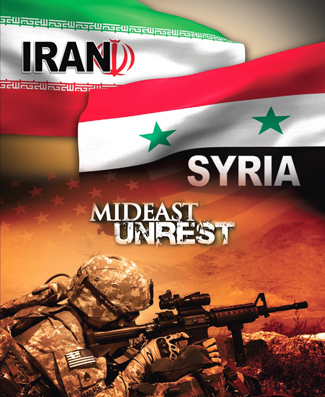 According to James P. Rubin, the war plans directed against Syria are intimately related to those pertaining to Iran. They are part of the same US-Israeli military agenda which consists in weakening Iran with a view to “protecting Israel”. The latter objective is to be carried out through a pre-emptive attack against Iran: “We’re not done with the possibility of an Israeli strike on Iran” says James P. Rubin. “That is where Syria comes in, says James P, Rubin. It is the strategic relationship between the Islamic Republic and the Assad regime that makes it possible for Iran to undermine Israel’s security. Over the three decades of hostility between Iran and Israel, a direct military confrontation has never occurred — but through Hezbollah, which is sustained and trained by Iran via Syria, the Islamic Republic has proven able to threaten Israeli security interests. This “first step” has already been launched. It was implemented at the very outset of the insurgency in March 2012. The US and its allies have been actively supporting the Free Syrian Army (FSA) terrorists for over a year. The organization and training consisted in the deployment of Salafist and Al Qaeda affiliated terrorists, alongside the incursion of French, British, Qatari and Turkish special forces inside Syria. US-NATO sponsored mercenaries are recruted and trained in Saudi Arabia and Qatar. Rubin’s proposed “second step” is “to secure international support for a coalition air operation.” outside the mandate of the United Nations. “Russia will never support such a mission, so there is no point operating through the U.N. Security Council” says Rubin. The air operation contemplated by Rubin is an all out war scenario, similar to the NATO air raids conducted in Libya. Rubin is not expressing a personal opinion on the role of theUN. The option of “sidetracking” the UN Security Council has already been endorsed by Washington. The violaiton of international law does not seem to be an issue. US Ambassador to the UN Susan Rice confirmed in late May, in no uncertain terms, that “the worst and most probable scenario” in Syria might be the option of “acting outside of the UN Security Council’s authority”. While the participation of Israel in military operations is not mentioned, the thrust of Rubin’s article points to active cooperation between Washington and Tel Aviv in military and intelligence affairs, including the conduct of covert operations in support of the opposition rebels. This coordination would also be carried out in the context of the bilateral military-intelligence cooperation agreement between Israel and Turkey. “Coming to the rescue of the Syrian people” under a fake “humanitarian” R2P mandate is intended to destabilize Syria, weaken Iran and enable Israel to exert greater political control and influence over neighboring Arab states including Lebanon and Syria. War Crimes in the name of human rights: What we really need is “Regime Change” in the United States of America…. and Israel. For the last 41 years, Israel’s attack on the USS Liberty has been a taboo topic about which neither the Jewish state nor the US has allowed free and open discussion. Like a paid-off judge in the service of organized crime interests pounding his gavel on the bench, for the last 4 decades Israel and her supporters in the US government have bellowed ‘case closed’ and have raked over the coals anyone–including the survivors of the attack themselves–from arguing otherwise. Realizing the tidal wave of outrage that would occur if the American people were to come of age and lose their innocence in realizing what Israel did in murdering 34 American servicemen 4 decades ago in a premeditated act of war (to say nothing of the cover-up perpetrated by the US government) it has been on the list of forbidden topics……until recently. Cutting short his trip in Europe the first week of July, recently-appointed Chairman of the Joint Chiefs Adm. Mike Mullen flew to Tel Aviv along with an entourage of high-ranking US military personnel and, upon his arrival, rushed to meet with the highest-ranking members of Israel’s military establishment. While this is not unusual (as many such meetings have been taking place as of late) what was unusual was the topic discussed–Israel’s attack on the USS Liberty 41 years ago during the 6 day war and how ‘important’ it was that ‘history not repeat itself,’ given the present tensions existing between Israel and Iran. Considering the subject of that meeting and the well-known cover-up that has taken place these last 41 years, the meeting should have made headline news all over America. Sadly, however, it did not, just another testimony to the fact that America is now officially ‘occupied territory’ every bit as much as Arab Palestine. It is no secret Mullen is very friendly when it comes to the great experiment in Jewish self rule in the Middle East as well as his willingness to tow the line with regards to the sworn enemies of that great experiment. Immediately after the release of the National Intelligence Estimate in early December of 2007 stating that Iran had no nuclear weapons program America’s highest ranking military officer high-tailed it to Israel (the first Chairman of the Joint Chiefs to do so in a decade) to reassure her of America’s support that would last ‘1,000 years’. Readers will recall that American Free Press newspaper predicted in the aftermath of the National Intelligence Estimate being released that the prospect of war with Iran being cancelled (or delayed) would likely result in Israel resorting to desperate measures in getting her way. AFP further speculated that the timing of the release of the NIE was suspicious, coming just a few days before Dec 7, the day Americans remember the attack on Pearl Harbor and that possibly the release of the report was timed to prevent a sneak attack by an Israeli sub on a US ship stationed in the Persian Gulf. For her part, Israel is attempting to play the role of the innocent, cooperative and concerned ally in the wake of Mullen’s meeting by summoning Judge Jay Cristol, a federal bankruptcy judge in Miami and devoted Zionist who wrote a book in 2002 exculpating Israel of any wrongdoing in the Liberty attack. He is lecturing at military academies in Haifa and Ashdod on how to avoid the ‘mistakes’ that led to the attack on the Liberty. One thing is for certain. Out of all the topics to be discussed with his Israeli counterparts, Chairman of the Joint Chiefs Mullen picked the topic of the USS Liberty, and not because he felt nostalgic, sentimental or even–Heaven forbid–guilty over the way the Liberty survivors have been treated these last 41 years. He, like many within the military and intelligence establishment, no doubt realizes that America sits at the precipice of destruction and is no doubt trying to pull her back before that proverbial ‘point of no return’ is reached, if in fact it has not been reached already. And as sobering a theme as all this may be, the fact is that it may turn out to be much worse. What Israel wants, Israel gets, and the fact that an attack on a US ship has been thwarted does not mean that the fat lady has sung, as now the likelihood of a false flag attack on the American mainland has been made all the more probable. This time however, just for good measure and for spite, it might not be a city building coming down after being struck by an airliner, but rather an entire city being consumed in a mushroom cloud, courtesy of a place called Dimona and a criminal organization known as Mossad.